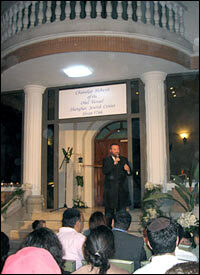 A new Jewish center has just opened in Shanghai, the first of its kind in China in 50 years. During the World War II, the city saved an estimated 30,000 Jewish lives by welcoming refugees fleeing the Nazis. But Shanghai's Jewish history has been all but forgotten there. Now, some are struggling to bring this chapter of the city's story back to life. Israeli journalist Dvir Bar-Gal is on a quest to recover the lost Jewish gravestones of Shanghai. Once there were four Jewish cemeteries here. But they were destroyed decades ago and the headstones scattered outside the city. Villagers, either through ignorance or simple pragmatism, had put many of the gravestones to new uses. Bar-Gal says he has found more than 85 Jewish headstones in villages outside Shanghai, where they've been used as washboards, stepping stones and construction materials. He's hoping to use the stones in a memorial for the Jews of Shanghai. The forgotten tombstones reflect the fading story of the city's Jewish population. Traces of those inhabitants have been diminished by time, politics and large-scale redevelopment. Bar-Gal now leads tours of Shanghai's Jewish sites, and he hopes to educate tourists as well as locals about Jewish history. Among the stops is the ghetto, which once housed thousands of Jews and now faces demolition. Some of the city's most important landmarks were built by Sephardic immigrants, who arrived in the 1870s. Later, Shanghai was an open port -- so visas weren't needed. Two waves of Jewish refugees found shelter here, first fleeing Russian pogroms, then the Nazis. After the Communist revolution in 1949, the Jewish population largely left the country. Nowadays, many Shanghainese have no idea about the city's Jewish history, Bar-Gal says. 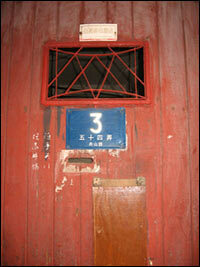 But as China has opened to the outside world again, Shanghai's Jewish community is growing once more. Shanghai's new Jewish center includes a synagogue, a school, a kosher restaurant and women's baths. Its opening was emotional for Rabbi Moshe Kotlarsky from Brooklyn, whose father found refuge here during World War II. "It's a very, very moving moment, to see a new synagogue being opened and built, with so many Jews here," Kotlarsky says. "This brings it around full circle." Despite the celebration, the Jewish community in China still has obstacles to overcome. Feelings run high over the fate of the old synagogue, Ohel Rachel, built 86 years ago. For many years it was used as a storeroom. Now the imposing, ivy-covered building stands empty inside the grounds of the Ministry of Education. Israel's Chief Rabbi Shlomo Amar, who recently visited Shanghai, hopes to convince the Chinese government to recognize Judaism as an official religion. "In our tradition, we only look to unite our own people," he says. "We don't proselytize. It's in that spirit I will approach the authorities." A Star of David marks a house inside the Jewish ghetto in Hongkou. At its peak, Shanghai housed 30,000 Jewish refugees. 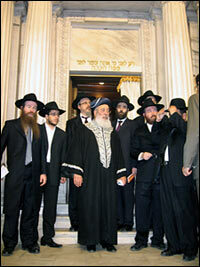 Israel's Chief Rabbi Shlomo Amar and other rabbis visit the 86-year-old Ohel Rachel Synagogue. 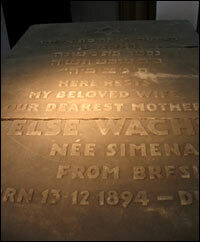 One of the 85 Jewish headstones that Dvir Bar-Gal has rescued from villages around Shanghai. 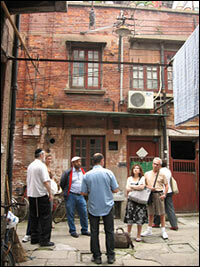 Dvir Bar-Gal (center, in blue shirt) leads a tour in Shanghai's Jewish ghetto. Shanghai's Rabbi Shalom Greenberg, originally from Brooklyn, speaks at the dedication of the new Jewish center. 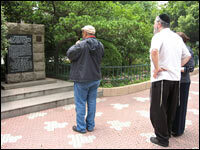 Tourists visit a memorial stone dedicated to the Jews who fled the Nazis to Shanghai. 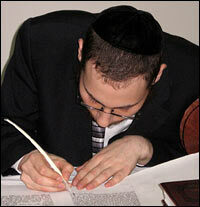 A scribe writes the last letters in a Torah. The letters were auctioned to help raise money for the Jewish center.